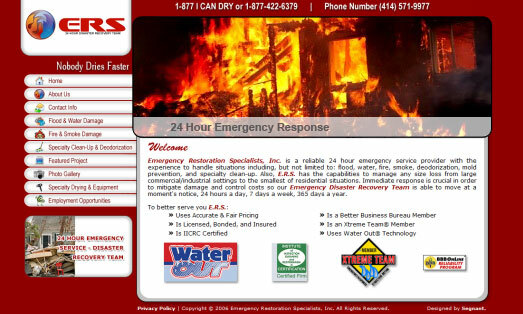 Emergency Restoration Specialists, Inc. is a reliable 24 hour emergency service provider with the experience to handle situations including, but not limited to: flood, water, fire, smoke, deodorization, mold prevention, and specialty clean-up. 1. Featured Project section: This section displays information about the company's projects with before and after photos. 2. Photo Gallery: This area illustrates the damage caused by floods, fire, etc. 3. Employment Opportunities: Here the user can view current open positions and apply online or email the position to a friend. Segnant has given Emergency Restoration Specialists the dramatic look and feel requested. Segnant has made the whole process of finding the right services related information not only easy and hassle free, but also interesting and colorful with use of great graphical layouts.